Speaker Robert A. DeLeo has vowed to make it a priority to get the workers bill approved in the House this year. A much-celebrated compromise that fast-tracked a state bill aimed at protecting pregnant women in the workplace has been stopped in its tracks. It’s all because of a one-word change that a House committee quietly added to the legislation before it passed that chamber last month without a dissenting vote. The discovery of that addition to the legislation — which a women’s advocacy group negotiated with the state’s powerful business lobby, Associated Industries of Massachusetts — puts the bill’s future in doubt. The proposal had moved quickly through the Senate last year, but AIM, which wields influence with the House and Governor Charlie Baker’s administration, had bottled it up in the House. 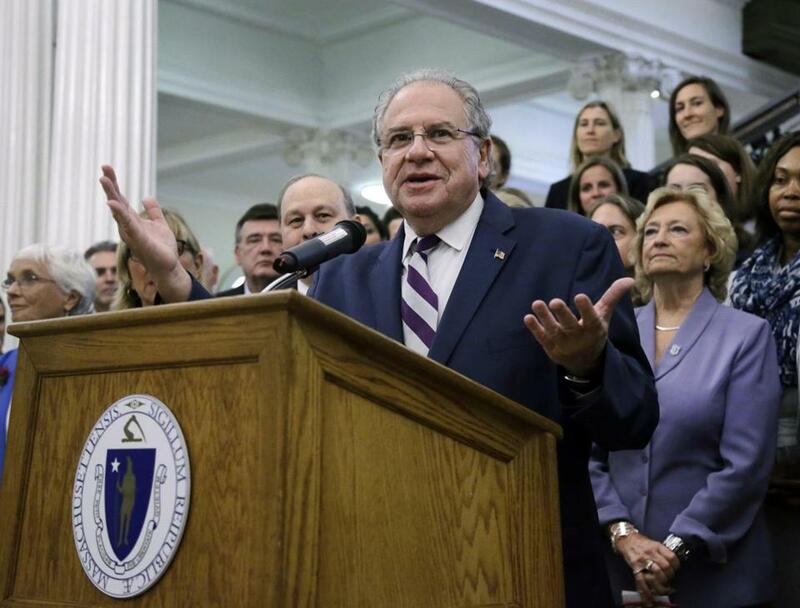 Speaker Robert A. DeLeo, following a Globe story detailing how AIM had successfully stopped the legislation from moving in the 2016 session, vowed to make it a priority to get the bill approved in the House this year. The compromise legislation emerged following weeks of negotiations between AIM representatives, legislative supporters, and the Hadley-based nonprofit MotherWoman Inc., the group that has led the fight for these protections. That version did not contain the word “knowingly” to open the section prohibiting an employer from discriminating in hiring of pregnant workers, according to AIM representatives and advocates. Linda O’Connell, the executive director of MotherWoman, said her group is “in discussions” with members of the coalition that has been fighting for the bill for several years. but she would not elaborate further. Asked how the language was added without sponsors being alerted, a DeLeo spokesman said the decision was made by the House legal staff. “This addition was made at the recommendation of House counsel to clarify the law,’’ DeLeo press aide Seth Gitell stated. He had no further comment. AIM spokesman Chris Geehern said his organization, which represents more than 4,000 small and large companies around the state, was not involved in putting the new word into the bill. Those pushing the bill are taken aback they were not told of the change. In addition to prohibiting an employer from denying a woman a job because of her pregnancy, the bill also makes it illegal for a boss to deny or demote a worker because of her need for pregnancy-related accommodations, unless it would impose an undue hardship on the business. Workers also cannot be forced to take leaves if they are able to perform their jobs.